Pierogis are a Polish gift to the world. And such, it is no surprise that everyone asks me for my Great Grandmother Janina's recipe for sweet and savory pierogis. At 100 years old, she is still kneading and filling them with meats, cheeses, and fruit from her kitchen. As this family recipe has to remain a bit of a secret, here is the basic guideline to make a fool proof dough. Fill them with whatever you please; I used fresh blueberries from Mick Klug Farm bought at Green City Market. On a clean work surface, mound the flour and make a hole in the center. Drop the eggs, oil, and the salt into the hole and carefully beat with a fork, leaving the flour untouched. Slowly incorporate small amounts of flour into the mixture, along with a little warm water, stirring and blending with a wooden spoon until all ingredients are thoroughly mixed. You will have to feel its texture, and make adjustments by adding small amounts of flour or water. It should not feel sticky or wet! If it does, you will have to add back flour slowly. Once you are satisfied with the dough, begin kneading it with your hands. On a dusted work surface, knead the dough for about 8-10 minutes until it is smooth and almost elastic-like. 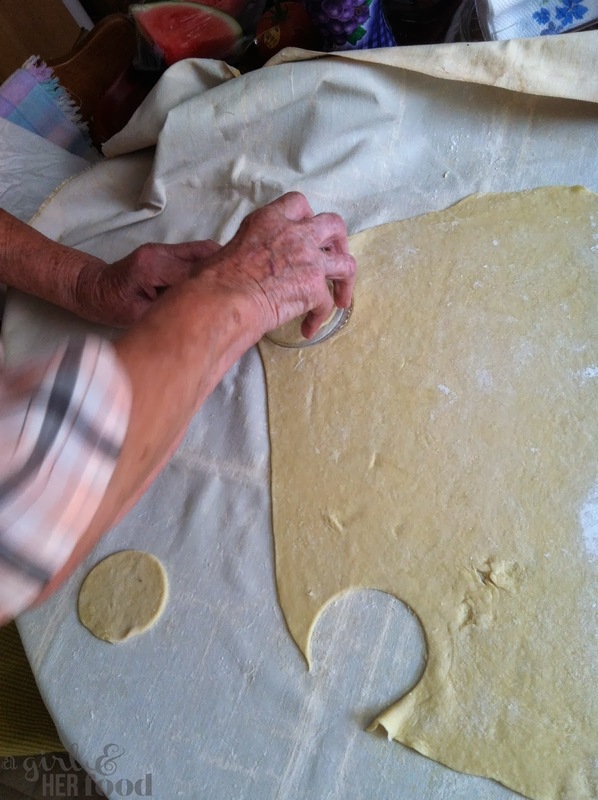 Some people recommend letting the dough rest for one hour by covering it with an inverted bowl, but my Grandma doesn't let it rest, and begins rolling it out right away, as she prefers to work with the consistency and elasticity of the dough in its current state. Toss the berries with the sugar in a large mixing bowl. Cover and let it marinate for about one hour in the refrigerator. Roll out the dough on a lightly floured work surface. 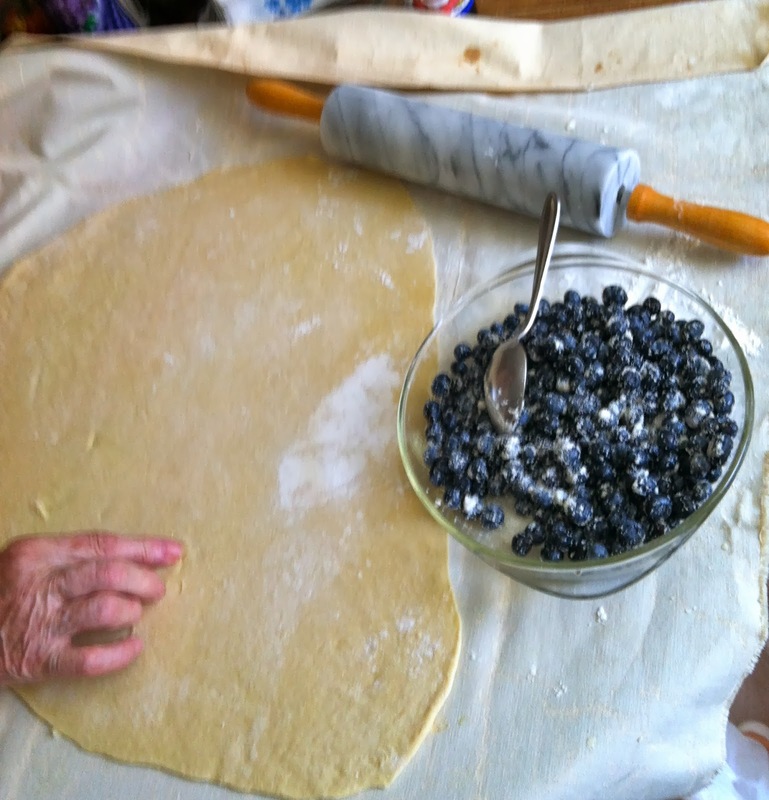 My Grandma uses a dusted pastry cloth as her rolling surface (as pictured). Roll out the dough so it's about 1/8 inch thick. 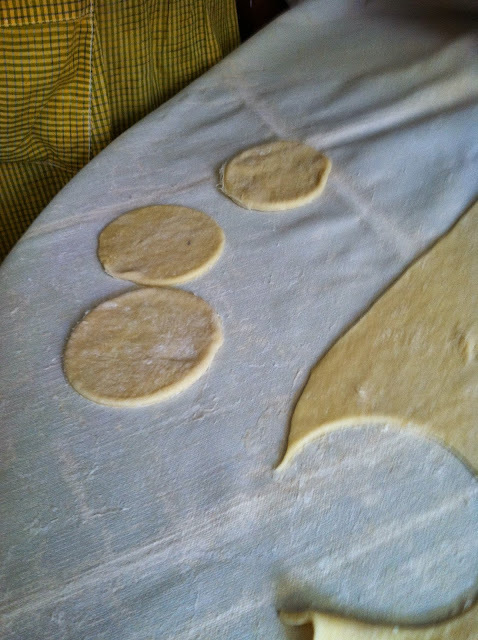 Cut circles into the dough with a rim of a glass. Cut circles with a rim of a glass. Spoon about one tablespoon of filling in the center of each circle, and fold the dough over to make a half circle. Make sure not to overfill! 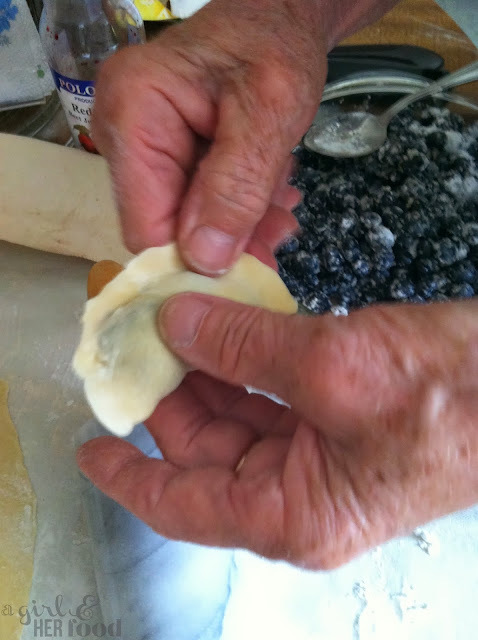 To seal the pierogi begin crimping the edges with your fingers or with the tines of a fork. Bring a large pot of salted water to a boil. 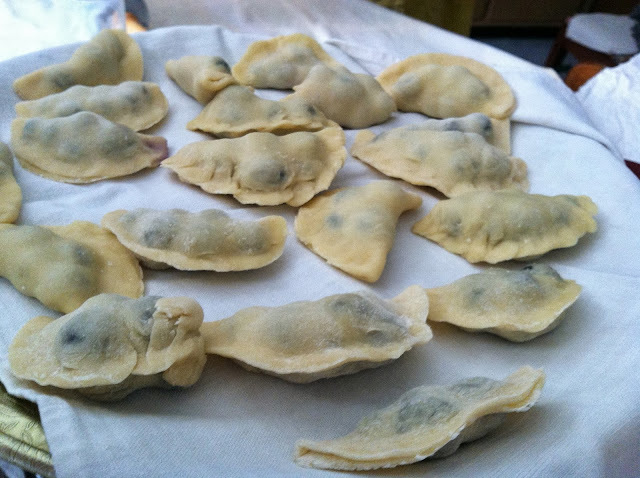 Boil the pierogis in batches, as not to overcrowd them, for about 3-5 minutes. Remove from the water with a slotted spoon and set aside on a plate. In a frying pan, melt the butter over medium high heat, and add the pierogis for several minutes until lightly browned. Again, work in batches, you never want to overcrowd them. Transfer to a warm platter and serve immediately. I love to top my pierogis with a dab of sour cream! Love this! And it just reminded me that I have some pierogis in my freezer that my grandmother made a few months ago--potato and cheese, and sauerkraut). It sounds like your great-grandmother is very much like mine, hands made for and from a lifetime of cooking (the floured used-forever cloth must also be a Polish thing--every woman on the Polish side of my family does that). Our family learned its lesson on secret recipes though after a "to-do" when my great-grandfather only giving one of his sons the recipe for his kielbasa before he died. Even so, nothing we've tried to make from my great-grandmother's recipes cards (her sweet bread especially) has ever worked quite the way it did when she made it. Also reminds me to ask my grandma if she's making paczki next week! Copy and paste this link into an e mail or instant message:When you arrive to visit your uncle, you notice something's wrong. He's not there to greet you and there was an explosion just as you arrived. Rescue your uncle using his newest invention, the Interdimensional Shift Device. \"\u0027The Art Of War.\u0027 \u0027The daddy shirt Book Of Five Rings.\u0027 \u0027Marcus Aurelius.\u0027\"\"Psychology books,\" says Miguel Perez. \"Business, family reunion shirt ideas Wall Street,\" adds Cortina. Steven Gruel, a former federal prosecutor who investigated dinosaur shirt Cortina\u0027s gang, says Nuestra Familia ran its operations like a Fortune 500 company.